Between 1954 and 1962 (with a five year period studying in Austin, Texas) I lived in Mexico City and Nueva Rosita, Coahuila. I watched lots of Mexican TV and saw Mexican films, mostly the very funny ones by Mario Moreno “Cantiflas” and a few Mexican westerns with Pedro Infante and Jorge Negrete. Without knowing I saw art films by Buñuel because I had the hots for the beautiful Mexican actress Silvia Pinal who appeared in three of his films, Viridiana, The Exterminating Angel and Simón del desierto. I watched the fabulous tenor Pedro Vargas’s program that had a comedian called el Chino Herrera who attempted to act like a Mexican Chinese man. He would pronounce all words with rs as ls. But there was one comedian who was a fave. His name was José Antonio Hipólito Espino Mora but we all knew him as "Clavillazo, the man who talks with his hands." I watched with delight his hands move as he gesticulated while wearing a bizarre three-cornered hat. It may have been Clavillazo who taught me to notice hands and to recognize their importance. My Rosemary has taught me to notice how fingers are placed with hands during my portrait sessions. I notice how classic ballerinas and modern dancers move their hands with grace. I can state here that not only am I a decent portrait photographer but I also know how to photograph hands. 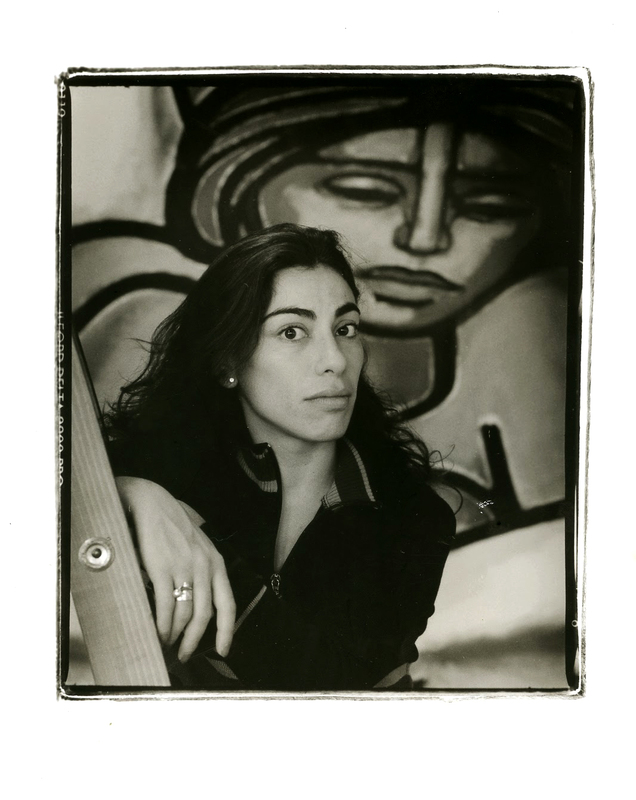 As evidence to that boast I have here two photographs that I took minutes one from the other, the latter one with b+w infrared film, of a beautiful Mexican woman called Ivanova. She had a voluptuous body but I was attracted to her strong hands. I am sure she might have been able to crack a nut with one hand. Argentines living in the Southern Hemisphere seem to do things differently or backwards. I have the memory as a child of going for dinner at the house of my parent’s friends and being offered soup at the end of the meal. The rationale so I was told years later is that if the soup is very well made there will be room for it after a big meal. In Spanish, not only Argentine Spanish, Argentines are argentinos and July is julio and Monday is lunes. That’s not just the way it is but because it's is a rule established by the Real Academia Española. I have never known why the Índice (Index) is always at the end of Argentine books. The titles of books including novels only capitalize the first letter of the first word in the title. The same applies to the names of the stories in a collection of shorts stories. In the index (at the end of the book) the same ‘rule’ applies. Since I could no longer bear not knowing this I fired off an email to my friend Roberto Baschetti, a scholar who works at the Biblioteca Nacional Argentina. la mayúscula-minúscula va solo en la primera palabra porque el argentino por naturaleza es vago y hacerlo como vos decís genera un esfuerzo extra. O sea: ¡¡¡ufa che... no jodás !!! te contestarían. to begin brodi would end up being a very thin broth since the real strong and thick Italian one is brodo. the lowercase-uppercase applies only to the first letter because the Argentine, by nature is lazy, and to write it as you suggest would generate an extra effort. Or they would answer: uffa, che…don’t screw me around…!!! So I will never know. 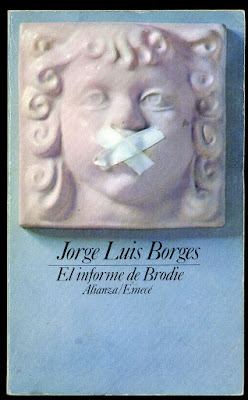 For reasons that I cannot explain the one mayor work I had not read by Argentine author Jorge Luís Borges was El informe de Brodie. I purchased a pristine used copy through AbeBooks and I received it from England yesterday. I read the book in the evening. I was particularly affected by La señora mayor (in Argentina, especially the titles of books and of stories have only the first letter of the first word capitalized). There is a description (a lovely one if I can use that word) of the old woman protagonist who is in her 90s and is losing her memory. And remember that Borges wrote this story in 1970. Borges repeats in many poems and stories that we are only of our memories and that our memories are recollections of things forgotten. I was struck by the description (the story is in entirety below in Spanish but I will insert a translation into English of that part that grabbed me) because in 1970 my grandmother went to visit her son (my uncle Tony) in Egypt. When she returned she was in her middle 70s and she had a blank look and did not recognize any of us. After a few months we could not handle her and we took her to nun's retreat in Cuernavaca, Mexico. After a year she became violent so we had to place her in an institution and she died not too much later. I have often wondered if the Borges idea of a constant present that contains the past and the future is not some influence he might have gained from having read Albert Einstein. Borges mentions Heraclitus and his changing waters of a river but there is much more. If you search Google with Einstein, Borges there is lots to ponder about. La casa de los Rubio ocupaba los altos de una mercería del barrio. La escalera lateral era angosta; la baranda, que estaba a la derecha, se prolongaba en uno de los costados del oscuro vestíbulo, donde había una percha y unas sillas. El vestíbulo daba a la salita con muebles tapizados, y la salita al comedor, con muebles de caoba y una vitrina. Las persianas de hierro, siempre cerradas por temor a la resolana, dejaban pasar una media luz. Me acuerdo de un olor a cosas guardadas. En el fondo estaban los dormitorios, el baño, un patiecito con pileta de lavar y la pieza de la sirvienta. 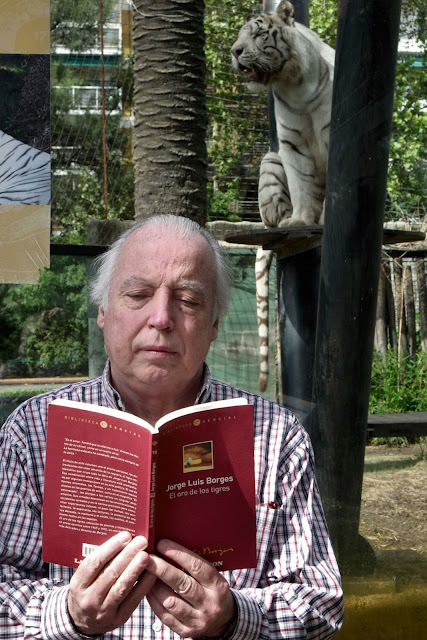 En toda la casa no había otros libros que un volumen de Andrade, una monografía del héroe, con adiciones manuscritas, y el Diccionario Hispano-Americano de Montaner y Simón, adquirido porque lo pagaban a plazos y por el mueblecito correspondiente. Contaban con una pensión, que siempre les llegaba con atraso, y con el alquiler de un terreno –único resto de la estancia, antes vasta– en Lomas de Zamora. 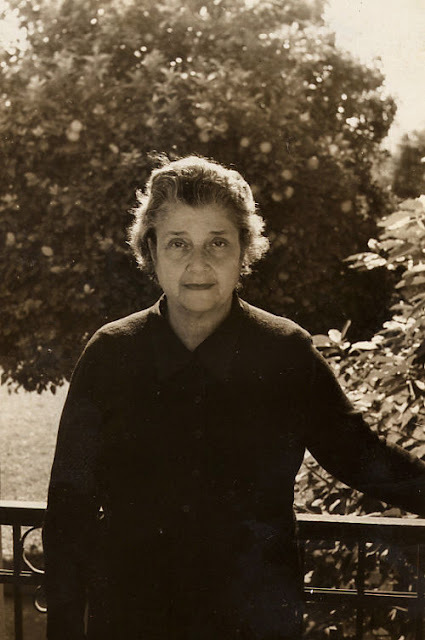 Clara Glencairn de Figueroa era altiva y alta y de fogoso pelo rojo. Menos intelectual que comprensiva, no era ingeniosa, pero sí capaz de apreciar el ingenio de los otros y aun de las otras. En su alma había hospitalidad. Agradecía las diferencias; quizá por eso viajó tanto. Sabía que el ambiente que le había tocado en suerte era un conjunto a veces arbitrario de ritos y de ceremonias, pero esos ritos le hacían gracia y los ejercía con dignidad. Sus padres la casaron, muy joven, con el doctor Isidro Figueroa, que fue nuestro embajador en el Canadá y que acabó por renunciar a ese cargo, alegando que en una época de telégrafos y teléfonos, las embajadas eran anacronismos y constituían un gravamen inútil. Esta decisión le valió el rencor de todos sus colegas; a Clara le gustaba el clima de Ottawa –al fin y al cabo era de linaje escocés– y no le disgustaban los deberes de la mujer de un embajador, pero no soñó en protestar. Figueroa murió poco después; Clara, tras unos años de indecisión y de íntima busca, se entregó al ejercicio de la pintura, incitada acaso por el ejemplo de Marta Pizarro, su amiga. I have a project. I have an important project. It involves a very good friend who by circumstances beyond his control spends most of the day in secluded daydreaming. His name is Juan Manuel Sánchez. 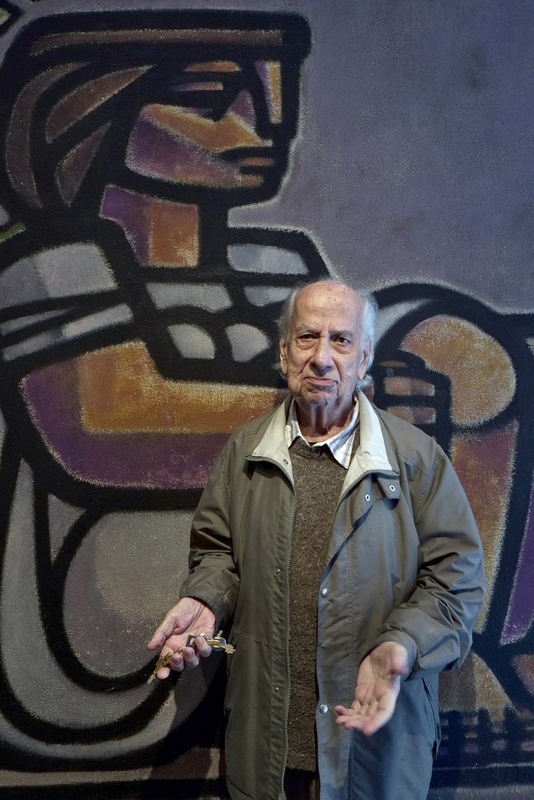 He is an 86 year old Argentine painter part of a group called Movimiento Espartaco or Grupo Espartaco (1959-1968) of 9 artists (Esperilio Bute, Pascual Di Bianco, Elena Diz, Ricardo Carpani, Raúl Lara, Mario Mollari, Juan Manuel Sánchez, Carlos Sessano and Franco Venturi). Espartaco promoted social art in that terrible decade in Argentina of military coups that brought in the generals that disappeared people. They rejected what they considered to be cultural colonialism, perhaps advance noticing the globalization and the Starbucking of the world to come. Juan Manuel Sánchez married Argentine painter Nora Patrich and they moved to Vancouver in the late 80s. For about 10 years these friends of mine and I collaborated in a multitude of projects the principal one being on our nostalgia for our native land and city of Buenos Aires. 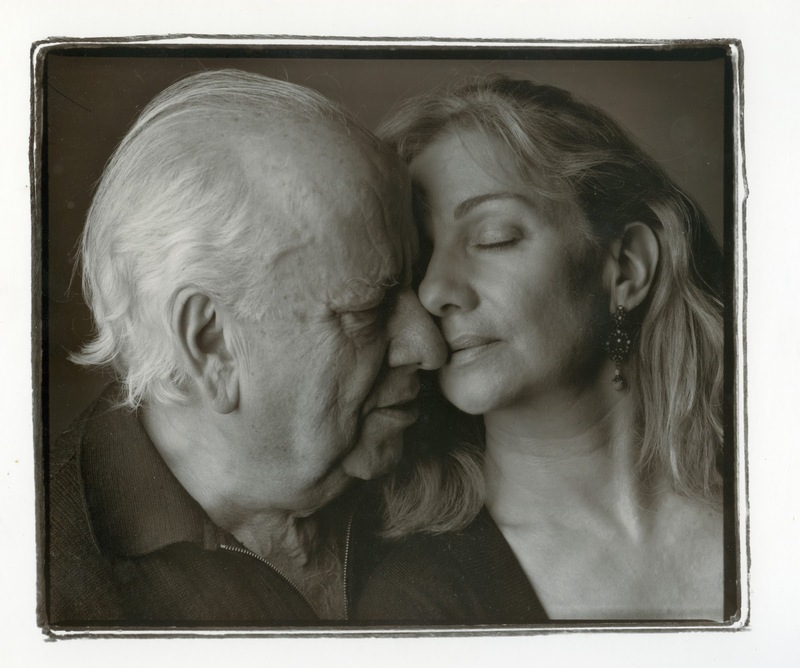 Five years ago the couple separated and returned to Buenos Aires in separate airplanes. Sánchez lives in his little studio in downtown Buenos Aires. It is neat as a pin but he is beginning to lose his short term memory and does little work even though as I found out in April of this year he has not lost his immaculate artistic ability. Having returned to Vancouver I want to see this man somehow press out from his mind all that knowledge that has come from years of wielding a brush and principally painting his obsession to find Plato’s essence of what a woman is. Sánchez once told me that one day he will paint one line, or perhaps a dot on a large canvas when he has finally resolved (he uses the more elegant resolver in Spanish) what that essential (or essence) woman is. I sat down with him for coffee and for a strong fortified sweet wine called moscato in a nearby café to his studio on Paraguay and Talcahuano. We talked about art and music and inspiration. I grieved at the huge distance that is between us geographically. At one time he was very good with a computer but once he arrived in Buenos Aires he had one no more. I communicate with him via Skype (my computer to his phone).We have long conversations. I am convinced that to keep his alertness and at the same time to gain something from him that would be a patrimonio nacional, he has to sketch, draw and paint. Lately, in the beginning of a bitter Buenos Aires winter he stays home. I can imagine him staring out the window. On the other side is an apartment where Sánchez has told me Jorge Luís Borges lived. Sánchez lives a few blocks from the Teatro Colón opera house and yet there he is silent and unmoving in a limbo of the imagination. The trick is to coax out that imagination. It is in the form of a lovely 35 year old woman (a mother of two boys) who is going to be introduced to Sánchez in his apartment by Nora his former wife. She will then pose for him and Sánchez will do what he does best. Cris (Cristina) will chat and ask questions and get an accelerated arts education. She will get sketches and perhaps even paintings. Will she be his last muse? When people in Vancouver ask me about Sánchez I compare him to Jack Shadbolt. Would Shadbolt have been allowed to live in such isolation? I have told Sánchez that if he really gets enthused to contact me immediately and I will fly to Buenos Aires like a shot.